I say I’m a weaver who works with my own hand dyed yarns. Most people picture me sitting at the loom, serenely throwing the shuttle. And that’s true, though, often the ‘serenity’ is more of a rhythm induced near-coma trance. But they never imagine the immense amount of just plain materials handling that goes into this work. I buy the plain white cones, skein them up on a swift, and scour/rinse them and hang them to dry. They need to be in skeins for dyeing because the dye cannot penetrate the tightly packed cone. After dyeing (and drying again), I need them back onto a cone or bobbin. Skeins rarely wind off smoothly (particularly after moving through the wet-dry process a couple of times). So back onto the swift and from there onto 1/2 lb bobbins until I measure out warp, or wind onto the bobbin shuttles. 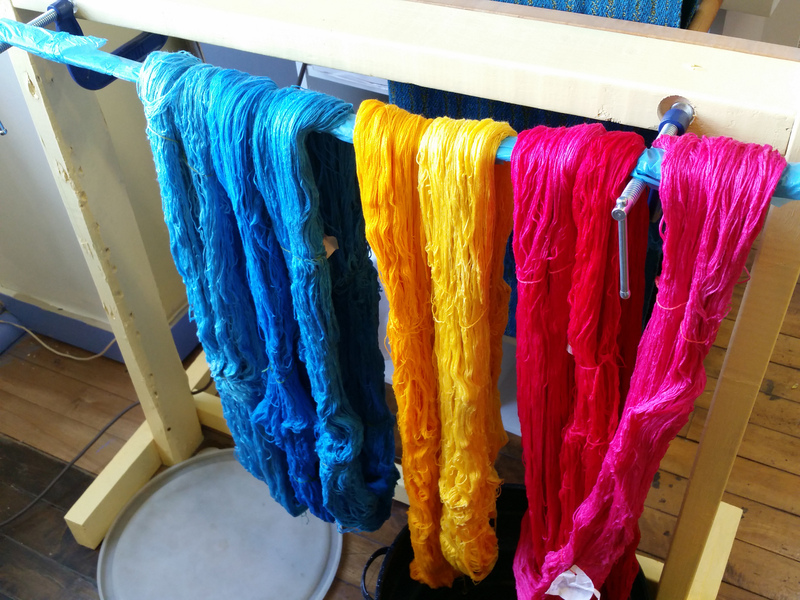 The skeins below are over 10 lbs of lovely rayon and tencel in 15 skeins scoured for dyeing and use in the Adirondack Folk School classes June 3-5, and July 6-8, in a few weeks. Over the next week I’ll add images to illustrate this process…the one that ends with gorgeous colors for the scarf my students will design, make and take home.